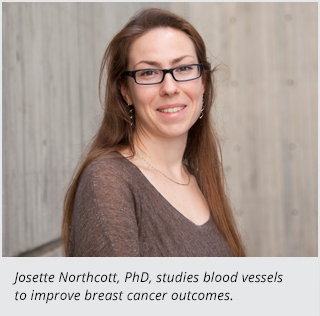 The role that blood vessels play in the development and the treatment of breast tumors led Josette Northcott, PhD, to examine the potential of a substance called HoxA5. The growth of breast tumors is fueled by the formation of new blood vessels, a process called angiogenesis. In order to inhibit the growth of those blood vessels, antiangiogenic drugs are often given in combination with standard chemotherapy. Those drugs also reduce the “leakiness” of blood vessels, which can help chemotherapy travel more effectively to tumor tissue. The homeobox protein HoxA5 is a transcription factor that has been shown to inhibit blood vessel growth in skin and pancreatic tumors. Northcott, a postdoctoral scholar at the University of California, San Francisco School of Medicine, wondered if HoxA5 could possibly have the same result in breast cancer tumors. Northcott isn’t sure why that is. Her work on how HoxA5 affects chemotherapy uptake in breast tumors hasn’t revealed any differences compared to the control models. In fact, HoxA5 is just as responsive to chemotherapy in breast tumors as it is to skin and pancreatic tumors. But for some reason, breast tumors become more aggressive when treated with it. Since most deaths from breast cancer occur after the disease has metastasized, Northcott is also examining whether the combination of anti-angiogenics and chemotherapy can help inhibit metastasis. Northcott received a Basic Cancer Research Fellowship from the American Association for Cancer Research (AACR), which helped fund her research into HoxA5. The Basic Cancer Research Fellowship is a $50,000 grant for a clinical research fellow in the first, second or third year of his or her postdoctoral training. In an era when grant money is becoming harder and harder to find, Northcott is thankful for AACR’s support. As an AACR member, Northcott has attended conferences where she has benefited from the mentoring sessions with experience researchers. “It’s great to speak to more senior people and get their impressions of how things are going and get career or project advice,” she said. The meetings also prompt a sense of community and support, which she feels young researchers need and want. Sometimes, a conversation that begins at an AACR meeting sparks a new collaboration, she said. This post was originally featured on the AACR Foundation “Innovators in Cancer Discovery” page.